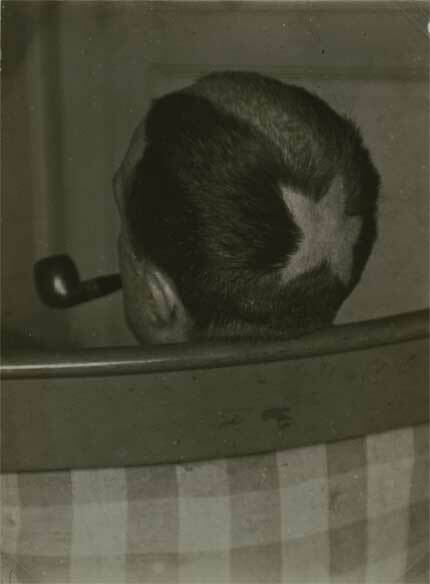 This portrait of Duchamp, probably taken by the artist’s friend Man Ray, shows the back of Duchamp’s head with his star/comet tonsure haircut. The motivations for and circumstances surrounding the haircut remain unclear, but the tonsure and star/comet imagery have multiple meanings. The tonsure historically served as a symbol of the célibat, or one who withdraws from society. By 1921 Duchamp had repeatedly withdrawn from artistic, social, familial, and romantic engagements. It is possible that the tonsure haircut also refers to Rrose Sélavy, Duchamp’s female alter ego, who first emerged in 1920. The five-pointed star, which from Roman times has been called the “Rose of Venus,” is associated with the goddess of love and functions as symbol of the feminine. In this way, the tonsure can be considered an outward sign of Duchamp’s multiple and shifting identities.